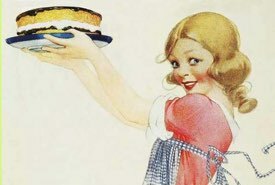 Vintage cake recipes are prized because they allow us to make those amazing cakes that we once enjoyed as children, and they bring back fond memories of friends and family and fun. Some of these cakes are unknown now and that's a shame because they are so attractive and delicious. Enjoy serving a unique dessert cake to your loved ones tonight. 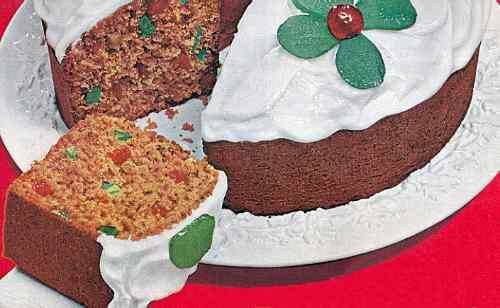 Now here's a vintage cake recipe for those times when you want to impress. Sift flour once, measure, add baking powder and salt, and sift together three times. Cream butter thoroughly, add sugar gradually, and cream together until light and fluffy. Add flour mixture, alternately with milk, as small amount at a time. Beat after each addition until smooth. Add vanilla; fold in egg whites. Bake in three greased 9-inch layer pans in slow oven (325°F) 15 minutes; then increase heat slightly to moderate (350°F) and bake 15 minutes longer. Remove cake from oven when done and allow to cool. Spread Moon Glow Lemon Frosting between layers and on top and sides of cake. Add lemon rind and juice to egg yolks. Stir in sugar until of right consistency to spread. Makes enough frosting to cover tops and sides of three 9-inch layers. All measurements are level. White Part: Whites of five eggs, half teacup of butter, two cups white sugar, two cups flour, one cup sweet milk, two teaspoonfuls baking powder, lemon flavoring. Gold Part: Yolks of five eggs, half cup butter, one cup sweet milk, two teaspoonfuls baking powder, flavor as you do light part. Dark Part: One cup brown sugar, quarter cup butter, half cup sweet milk, half cup molasses, two cups flour, one egg, half teaspoonful soda, all kinds of spices to taste. Put into a greased pan by the spoonful. The different colors will give it a spotted leopard-like effect when baked. —Kindness of J.M.B. 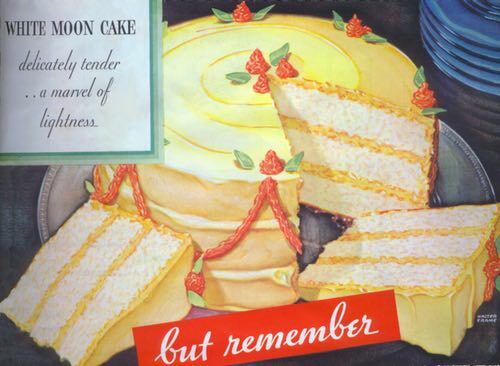 This vintage cake recipe dates from the 1940s. It's also known as the Mystery Spice Cake. Stir sugar into shortening until creamy smooth, add egg yolks, orange marmalade, grated and chopped peel, and nuts. Sift flour, baking powder, and salt together and add alternately with the liquid. Fold in stiffly beaten egg whites and pour batter into loaf pan. Bake in moderate oven (375°F) for 55 minutes, or until cake is well browned on top and shrinks slightly from sides of loaf pan. This vintage cake recipe makes a rich cake that's a good substitute for ice cream and cake, or for a dinner dessert. One and one-quarter cups sifted flour, 1 scant cup sugar, 1-1/2 teaspoons baking powder, 1/4 teaspoon salt. Sift all three times. To 1/3 cup melted butter, add 1 egg, and fill cup with milk. Add dry ingredients and beat vigorously. Bake in two layers in moderate oven (375°F) till done. Filling: One cup milk, 1 tablespoon butter, 1 tablespoon flour, 1/2 cup sugar, 2 egg yolks, 1/2 cup shredded coconut, 1/2 cup crushed pineapple. Scald milk and butter. Beat egg yolks, add flour and sugar and then add milk. Cook in double boiler till thick and smooth. Remove from fire and add coconut and pineapple. When cool put filling between the cake layers and on the top. Then cover the whole cake with a meringue made of two egg whites beaten stiff, 3 tablespoons powdered sugar, and 1/4 teaspoon baking powder. Sprinkle shredded coconut over the top and carefully brown coconut in the oven before serving. Bring to a boil while stirring constantly the peanut butter, butter, oil, and water. Remove from heat and stir in the sugar, flour, milk, eggs, soda, and vanilla. Pour into cake pan and bake in 350°F oven for 20 minutes, or until done. Top with your favorite icing. 3 cups sifted flour, 4 teaspoons baking powder, 1/4 teaspoon salt, 2 cups sugar, 4 eggs unbeaten, milk as needed, 10 tablespoons melted butter or other shortening. Sift the flour once, measure, add baking powder, salt, and sugar, and sift together three times. Break eggs into cup and fill cup with milk. Add another cup of milk; then melted butter. Put all ingredients into mixing bowl and beat vigorously 3 minutes. Bake in 3 greased 9-inch layer pans in moderate oven (375°F) for 25 minutes. Spread Hungarian Chocolate Frosting between layers and on top and sides of cake. 4 squares Baker's unsweetened chocolate cut in pieces, 2 tablespoons hot water, 2 eggs well beaten, 1 cup confectioners sugar, 1/2 cup butter. Melt chocolate in double boiler, add hot water, and blend. Add eggs and sugar. Remove from heat, but allow mixture to stand over hot water, stirring constantly until it is slightly thickened (about 3 minutes). Cool quickly to lukewarm. Add butter, 2 tablespoons at a time, stirring and blending after each addition. Makes enough icing to cover tops and sides of three 9-inch layers. This chocolate frosting may be kept in the refrigerator until needed for other vintage cake recipes. It can then be spread on cake layers that are nearly cold. This will soften the frosting so that it will spread easily. This three-layer cake is a wonderful cake for a young lady's birthday party or an anniversary. 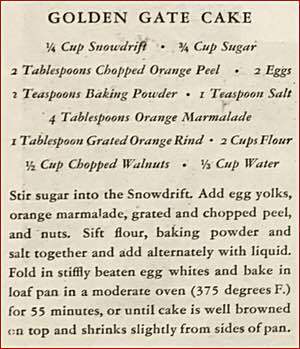 To make this vintage cake recipe, sift flour three times with baking powder. Cream shortening, add sugar gradually. Add the dry ingredients alternately with the milk and flavoring. Fold in the stiffly beaten egg whites. Color one half of batter pink. Place batter in cake pan in alternate strips. Bake in three layers in a moderate oven (375°F) for about 20 minutes, or until it tests done. Put layers together with white icing between. 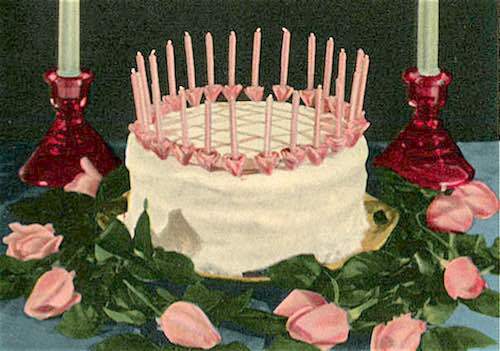 Ice top and sides of cake and decorate with small pink candles. Sugar, 1 cup; butter, melted, 1 tablespoonful; 1 egg, beaten to a froth; soda, 1 teaspoonful, dissolved in sweet milk, 2/3 cup; cream of tartar, 2 teaspoonfuls; flour to make so it will pour on tins. Bake like jelly cake, and put custard or jelly between. Remarks. — Mrs. J. A. Heister of Denver, Col., says: "It is cheap and good enough for anyone." And I cannot account for the name, unless it is because the Denver people take it with them when they go out to hunt the buffalo. Remarks. — No other place so appropriate for a poor man's cake recipe, as to let it follow charity cake, for who needs charity any more than a poor man is likely to. One cup of sugar, 1 cup of milk, 1 tablespoonful of butter, 1 teaspoonful cream of tartar, 1/2 teaspoonful of soda dissolved in the milk, 1 egg, a little cinnamon, and enough flour to make it as stiff as pound cake. These delicious jumbles are perfect for picnics, lunches, or simply nibbling. Butter, 1 cup; sugar, 2 cups; 2 eggs; sour or sweet milk, 1 cup; flour, 4 to 4-1/2 cups; baking soda, 1 teaspoonful, scant; cream of tarter, 2 teaspoonfuls; vanilla extract, 1 teaspoonful. Directions: Cream the sugar and butter, and add one-half the milk, in which the vanilla has been put; then one-half the flour, then the beaten eggs; then the other half of the flour into which the cream of tartar has been mixed by sifting together; lastly the other half of the milk in which the soda has been dissolved. Make in small cakes and bake quickly. Remarks: — Jumbles are always to be sprinkled with sugar, or rolled in sugar. For me, the more sugar the better is the jumble. Here's a delicious cake you will enjoy serving on any occasion. Granulated sugar, 3 cups; butter, 1 cup; 5 eggs; sweet milk, 1 cup; flour, 3 cups; cream of tartar, 2 teaspoonfuls; baking soda, 1 teaspoonful; salt, 1 pinch. Directions: Beat the butter, sugar, and yolks of the eggs to a cream; mix soda in the milk and the cream of tartar in the flour; add the whites just before the flour. Bake in jelly cake tins, browning a little. In Place of Jelly: Take the whites of 2 eggs, a little water, and the proper amount of powdered sugar to make thick for icing, beat together and with a knife spread over the top of each cake. Grate a fresh coconut and mix it with more sugar, and sprinkle it over the cakes; then layer them up, finishing the top the same. Remarks. — This vintage cake recipe is especially applicable for use upon occasions when ice cream is to be served. While compiling a recipe book of family recipes I came across one for a Graham Cracker Cake from the mother-in-law of my aunt. It seems to be lacking directions for putting it together, but I'll give you what I have. Makes 2 layers. Bake at 350°F for 30 minutes. 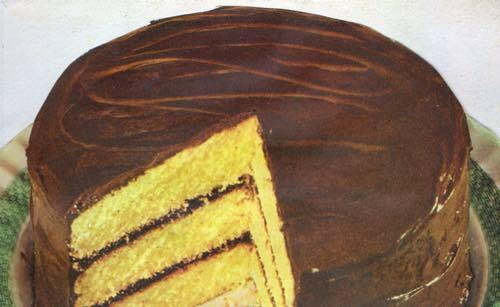 That's it — that's all there is to this vintage cake recipe! Hope it turns out okay for you.